This article was written for the Kinharvie Facilitation Network, in my role as a member of the Network’s steering group. Although written for facilitators, it is just as relevant for planners. Kinharvie Facilitation Network is based at the excellent Kinharvie Institute of Facilitation in Glasgow, which offers excellent training in group facilitation and other similar skills. I am a town planner. Most people think that means that I must know all about house extensions and planning permission. But that’s not what town planning is really about. 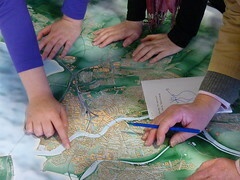 Town planning is about the future of the places that we live in – how to make better places. In my book, this means it should be all about creativity, ideas and forward thinking. One of the projects I’ve been working on recently is an innovative pilot project for creating a new city vision for Inverness. This will be used to guide the future change and growth in the city by influencing public and private sector investment in the next few years, partly through planning policy. It’s not up to me create that vision. Rather, I’m working with Highland Council and Architecture + Design Scotland (part of the Scottish Government) to enable the people of Inverness to create their vision for their city. It’s all about giving the space and opportunity to create their own vision. In other words, it’s about facilitation and collaboration. The process of creating the new city vision for Inverness will take about a year. I won’t explain the whole process here. Instead, I’ll focus one important part of the process – a series of three Future City Games which were used to generate ideas which, in turn, defined what the vision would be. These Future City Games were run by the British Council. They were, basically, fairly large scale facilitated events. Each took a full day and was for a maximum of 30 participants, organised into teams of around 6 people. The first day was for young people from schools and youth organisations. The other two days were for adults – who were drawn from local residents, businesses and public sector organisations such as the local Council and the NHS. I was in the privileged position of being an observer at each of the three Games. I say privileged because I was lucky enough to witness the creativity of everyone at the Games, seeing them progress from thinkin about global challenges – economic, social, environmental and cultural – through a sequence of discussions about local challenges, how to tackle those in Inverness, right through to identifying a single idea which everyone thought would successfully tackle global challenges at the local level. That’s quite something to do in a day! Planners spend years trying to do it… and we don’t always get it right. With my facilitator’s hat on, I thought the Future City Games were a useful tool for bringing people together from different walks of life to discuss complicated issues. Moreover, they did that in a way that was remarkably egalitarian and free of professional jargon. The Future City Games were also very effective at getting professional people out of their silos – and/or comfort zones – and thinking creatively about solutions. In my experience of planning, it’s all too common for people to be reactive and focus on problems, rather than being proactive about how to make things better. The Games managed to achieve that. Each of the three Games had a different lead facilitator, or Gamesmaster. Watching the different styles of each facilitator was interesting. It brought home to me just how much their attitude and behaviour influenced the atmosphere of the event and, I suspect, the mood of participants too. An enthusiastic, energetic Gamesmaster created that atmosphere; similarly with another quieter, more reflective Gamesmaster. So, different personalities can have a huge influence. This sounds obvious, but we forget it at our peril when organising this kind of event. Although a very useful approach, it is fair to say that the Future City Games had some (minor) limitations. For me, the biggest was the relatively low proportion of the population who could take part, due to the scale, cost and duration of the events, all of which are barriers to participation in different ways. 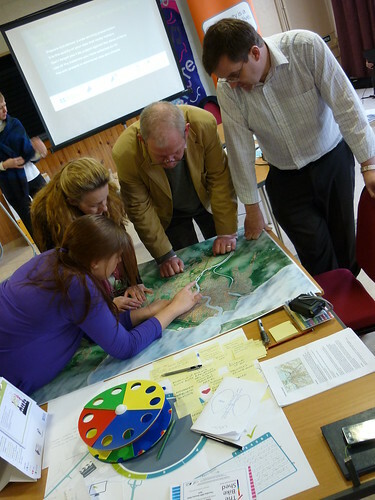 For more information on the wider city visioning process that the Inverness Future City Games were part of, check out my earlier blog post and Highland Council’s Inverness city vision blog.